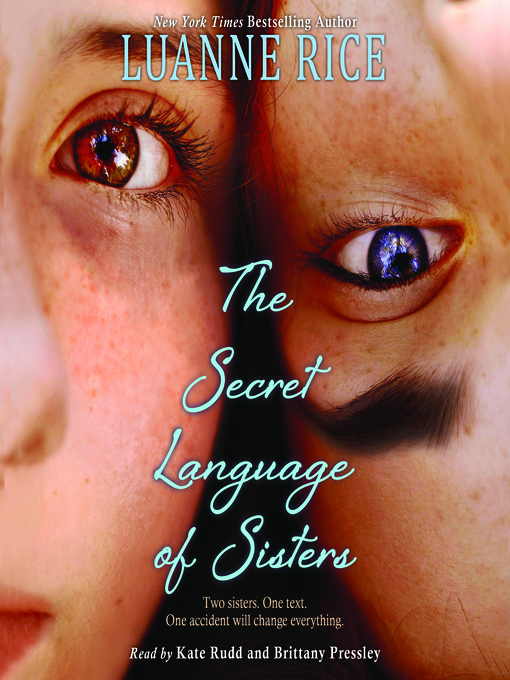 The Secret Language of Sisters by Luanne Rice is about two teenage sisters, Roo and Tilly. Roo is driving to pick Tilly up from a museum and trying to answer Tilly's texts at the same time, and that only can lead to trouble. Roo looks up from her phone just in time to avoid hitting an old lady, and her car flips over, and is completely destroyed. Roo's body is paralyzed. Later, while at the hospital, Tilly and her mother visit Roo, and Roo has a stroke right in front of them. The stroke results in locked-in syndrome; Roo can see, hear, and feel everything around her, but she can't move or speak at all. Everyone believes the stroke has caused Roo to be in a coma, and that she is not aware of anything that is going on around her. But this is not the case. Deep down, Roo believes that she will live through this and someday be able to walk again. But now, Tilly is only focused on her sister getting better. This book's chapters alternate between Roo and Tilly narrating. I liked this style of narrating. The reader gets multiple sides of the same story, what each sister is thinking. For example, Tilly blames herself for Roo’s accident, but Roo feels differently. But she can’t tell her that… After the crash, there is a long series of surgeries and treatments in hospitals, and it gets so bad at one point that Roo actually believes it would be better if she were dead. But she can’t tell anybody that, either. This book is probably best for people ages 12 and up, it talks about emotional and scary topics that little kids may find overwhelming, such as a loved one being very, very sick and you not knowing whether or not they will recover or die. The publisher's website says it recommends the book for grades 9 and up (age 13+). But felt like I connected with the characters – I felt like I was right there, on the spot, being one of the characters in the book. When something good happened to them, I felt happy with them. When something tragic happened, I felt sad. I’m only 11 going on 12, so I think any student, middle school and up, could read this. Daddy's afterthoughts: I bought this book for Julia at a Scholastic book fair at her elementary school. So apparently somebody thought it was appropriate for a grade 5 or 6 reader. I was actually surprised to see that Scholastic recommends it for only high school level readers. Julia really connected with this book; that was nice to see. But she came away with the sense that the accident was either Tilly's fault, or that blame was equally shared. In reality - anyone of driving age should know this - the fault lies with the driver. I have read other reviews of this book that criticized the author for doing too little to drive that point home (no pun intended): See for example here, and here. But this is something that is easily ameliorated with a parent conversation after reading. I am a fan of the switching-narrators technique. This book struck me as kind of an adolescent After-School-Special-Lifetime-Movie-of-the-Week-YA version of Dalton Trumbo's Johnny Got His Gun, a war-protest novel whose chapters alternate between the locked-in thoughts of a blind, deaf, limbless combat casualty in a hospital and flashbacks to the same character's earlier life, when he was young and whole. Haunting. But not for tween readers. Barbara Kingsolver does something similar in The Poisonwood Bible, one of my favorite books, alternating between 4 or 5 (it's been a while, sorry) different characters' points-of-view; like Sisters, one of the characters is mute. A beautiful and mesmerizing read. Also not for tween readers. What's my point? I have no idea. Just wanted to plug two awesome books for the grown-ups out there. Excellent review, Julia. Your writing is getting really good!